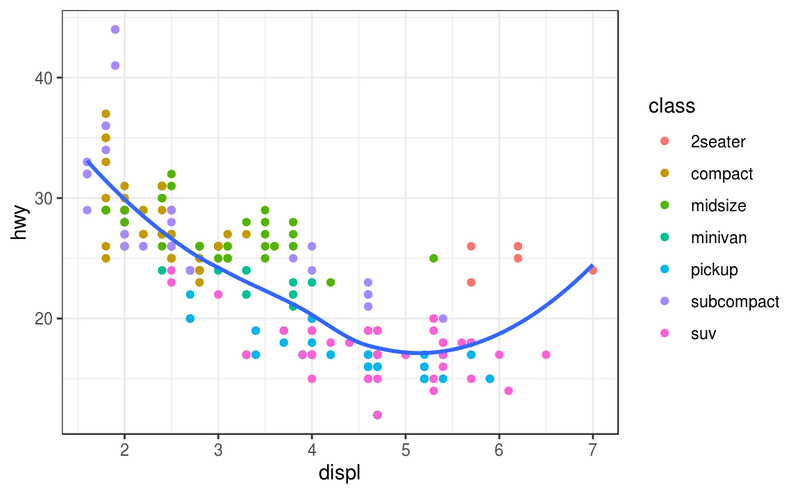 In exploratory data analysis, you learned how to use plots as tools for exploration. 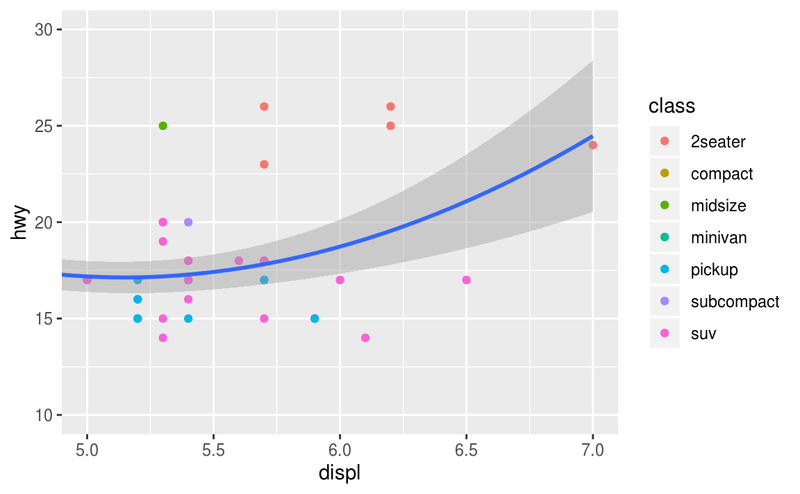 When you make exploratory plots, you know—even before looking—which variables the plot will display. 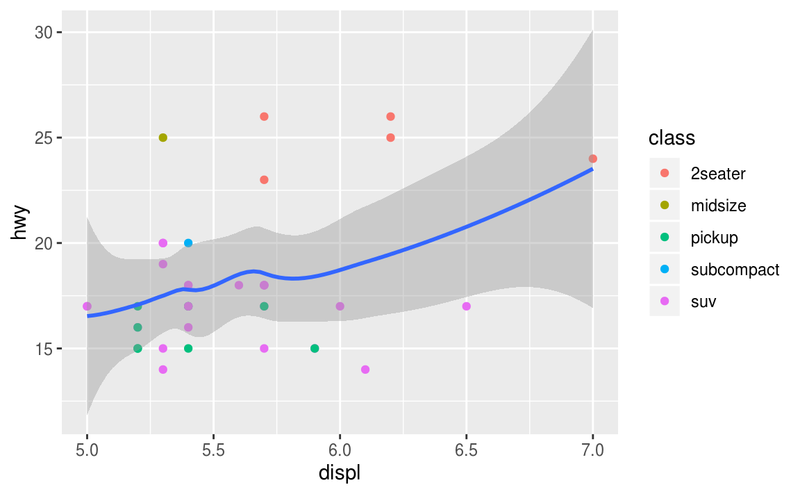 You made each plot for a purpose, could quickly look at it, and then move on to the next plot. In the course of most analyses, you’ll produce tens or hundreds of plots, most of which are immediately thrown away. Now that you understand your data, you need to communicate your understanding to others. Your audience will likely not share your background knowledge and will not be deeply invested in the data. 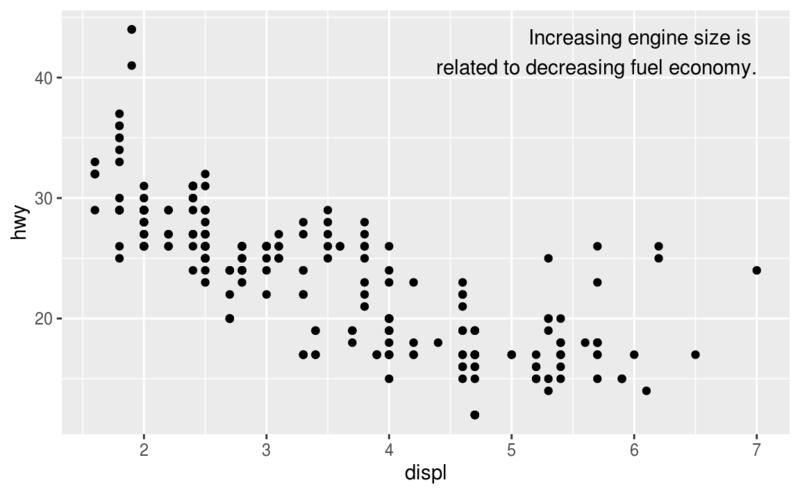 To help others quickly build up a good mental model of the data, you will need to invest considerable effort in making your plots as self-explanatory as possible. 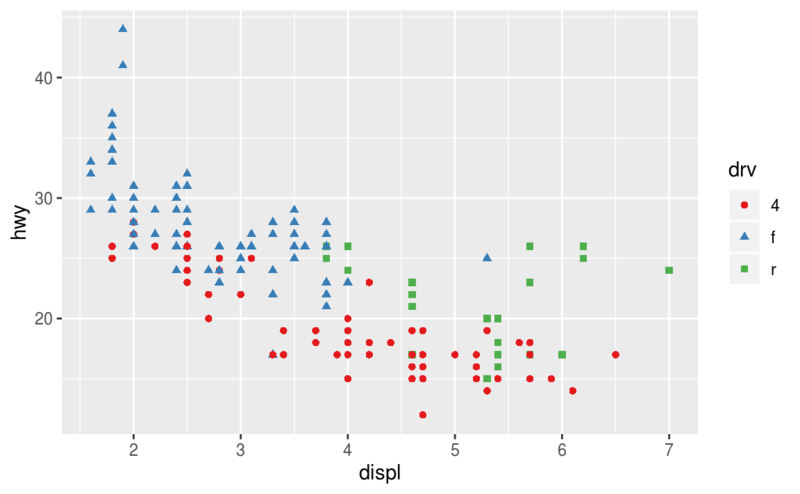 In this chapter, you’ll learn some of the tools that ggplot2 provides to do so. This chapter focuses on the tools you need to create good graphics. I assume that you know what you want, and just need to know how to do it. For that reason, I highly recommend pairing this chapter with a good general visualisation book. I particularly like The Truthful Art, by Albert Cairo. It doesn’t teach the mechanics of creating visualisations, but instead focuses on what you need to think about in order to create effective graphics. 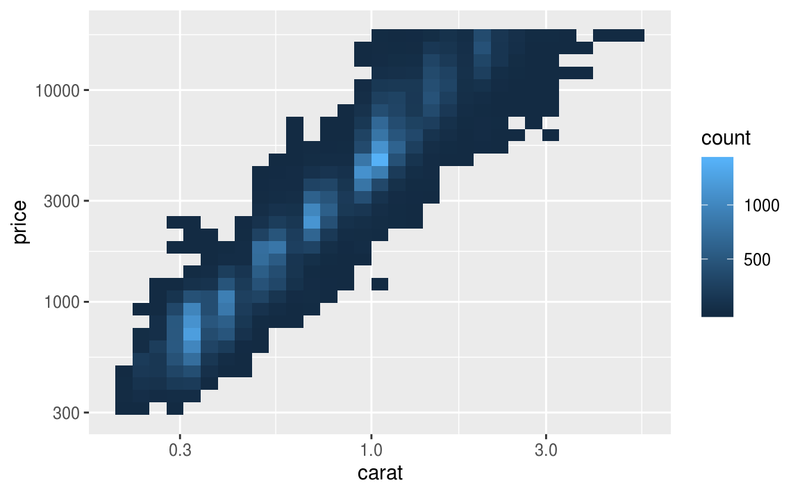 In this chapter, we’ll focus once again on ggplot2. 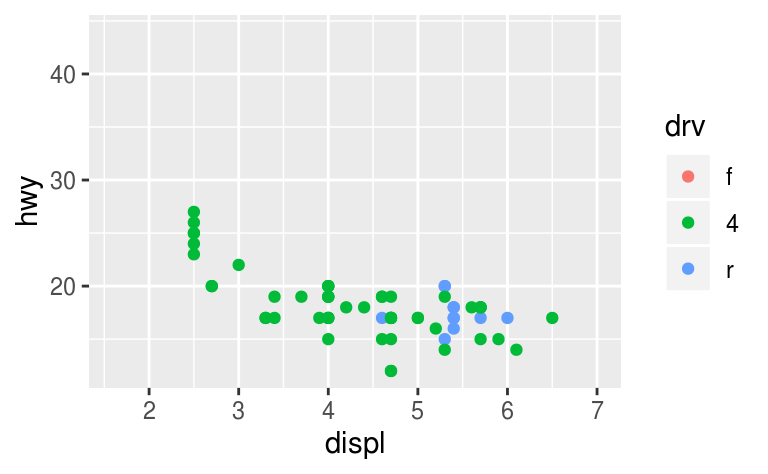 We’ll also use a little dplyr for data manipulation, and a few ggplot2 extension packages, including ggrepel and viridis. Rather than loading those extensions here, we’ll refer to their functions explicitly, using the :: notation. 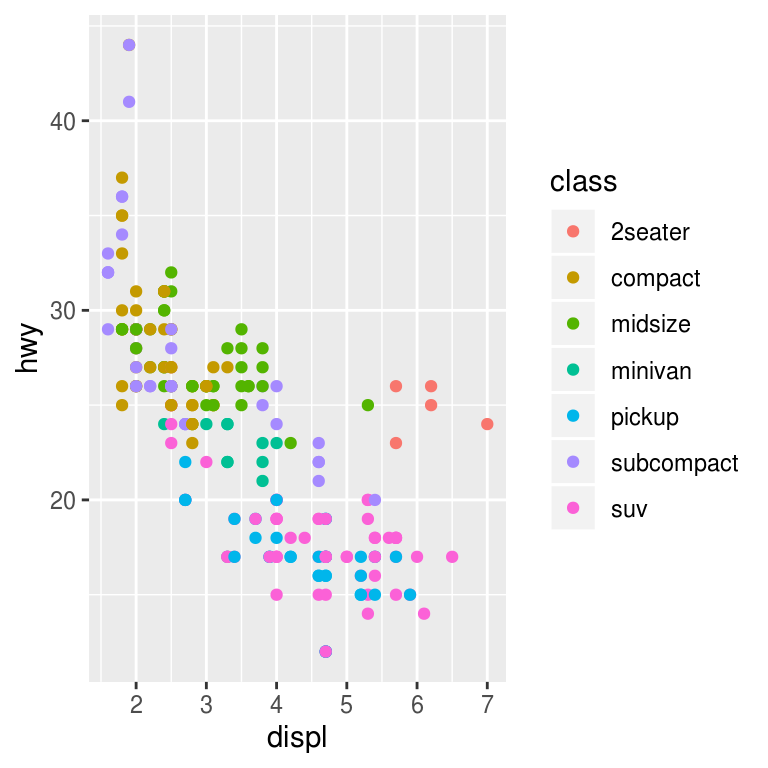 This will help make it clear which functions are built into ggplot2, and which come from other packages. Don’t forget you’ll need to install those packages with install.packages() if you don’t already have them. The purpose of a plot title is to summarise the main finding. Avoid titles that just describe what the plot is, e.g. 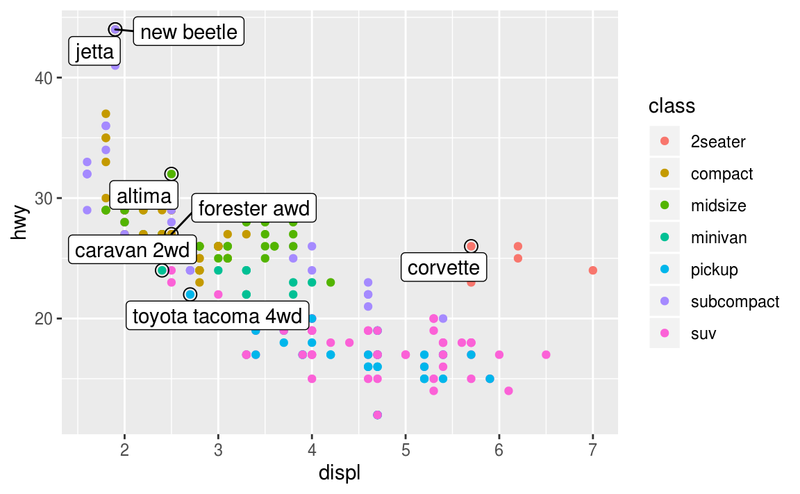 “A scatterplot of engine displacement vs. fuel economy”. subtitle adds additional detail in a smaller font beneath the title. caption adds text at the bottom right of the plot, often used to describe the source of the data. You can also use labs() to replace the axis and legend titles. It’s usually a good idea to replace short variable names with more detailed descriptions, and to include the units. 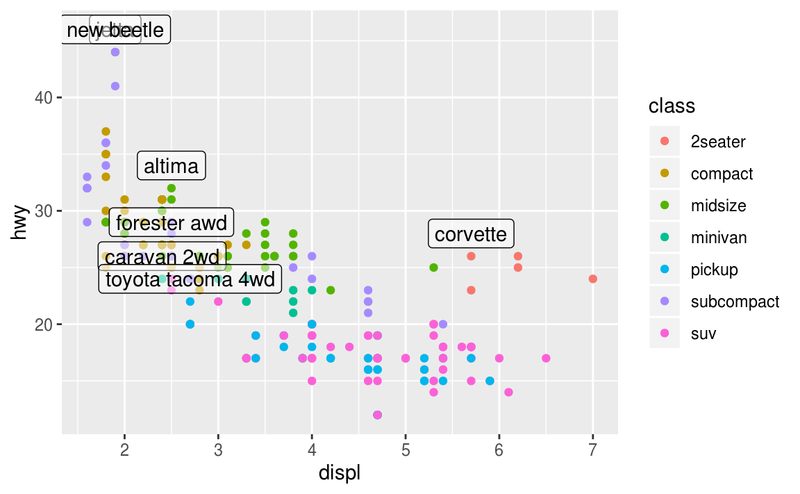 Create one plot on the fuel economy data with customised title, subtitle, caption, x, y, and colour labels. 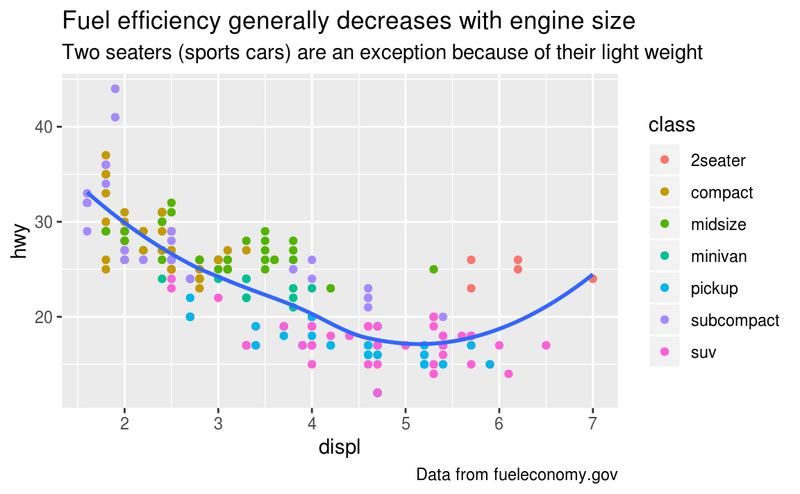 The geom_smooth() is somewhat misleading because the hwy for large engines is skewed upwards due to the inclusion of lightweight sports cars with big engines. Use your modelling tools to fit and display a better model. Take an exploratory graphic that you’ve created in the last month, and add informative titles to make it easier for others to understand. In addition to labelling major components of your plot, it’s often useful to label individual observations or groups of observations. The first tool you have at your disposal is geom_text(). geom_text() is similar to geom_point(), but it has an additional aesthetic: label. 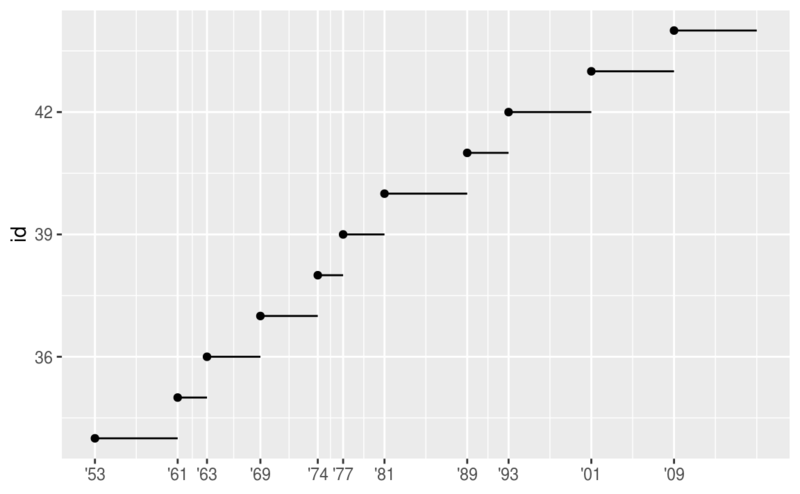 This makes it possible to add textual labels to your plots. Note another handy technique used here: I added a second layer of large, hollow points to highlight the points that I’ve labelled. 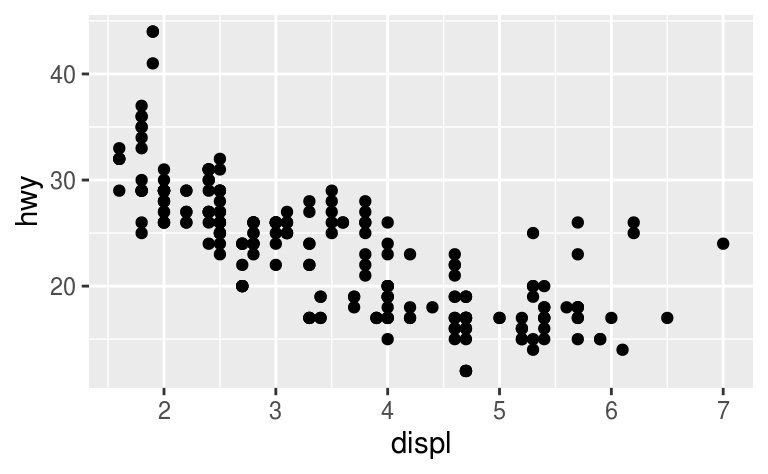 Alternatively, you might just want to add a single label to the plot, but you’ll still need to create a data frame. 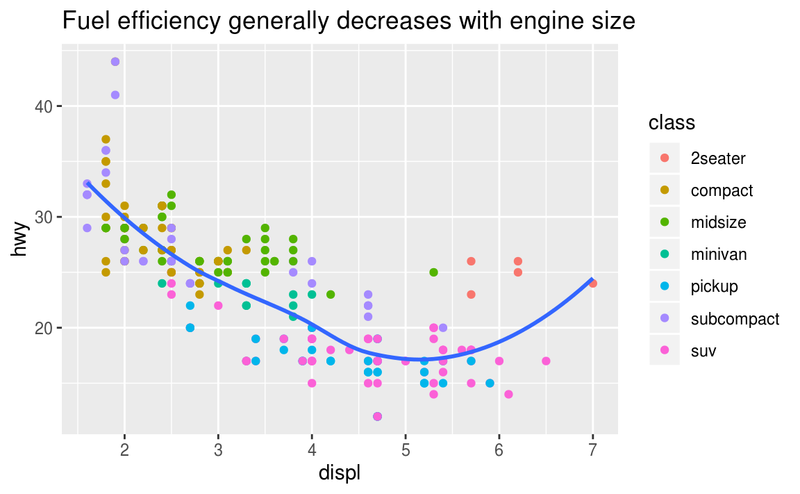 Often, you want the label in the corner of the plot, so it’s convenient to create a new data frame using summarise() to compute the maximum values of x and y.
label = "Increasing engine size is \nrelated to decreasing fuel economy." Note the use of hjust and vjust to control the alignment of the label. Figure 28.1 shows all nine possible combinations. Figure 28.1: All nine combinations of hjust and vjust. Use geom_hline() and geom_vline() to add reference lines. I often make them thick (size = 2) and white (colour = white), and draw them underneath the primary data layer. That makes them easy to see, without drawing attention away from the data. 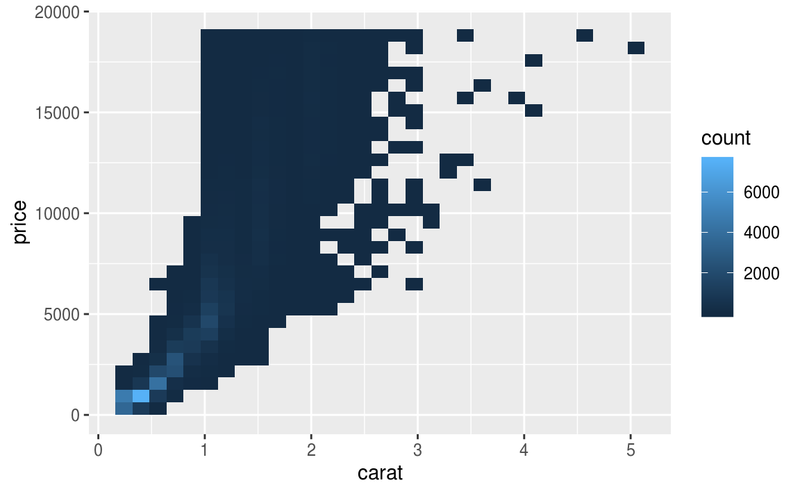 Use geom_rect() to draw a rectangle around points of interest. The boundaries of the rectangle are defined by aesthetics xmin, xmax, ymin, ymax. Use geom_segment() with the arrow argument to draw attention to a point with an arrow. Use aesthetics x and y to define the starting location, and xend and yend to define the end location. The only limit is your imagination (and your patience with positioning annotations to be aesthetically pleasing)! 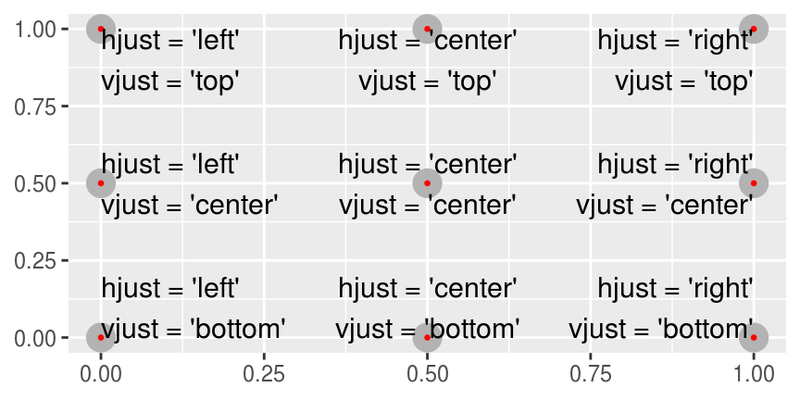 Use geom_text() with infinite positions to place text at the four corners of the plot. Read the documentation for annotate(). 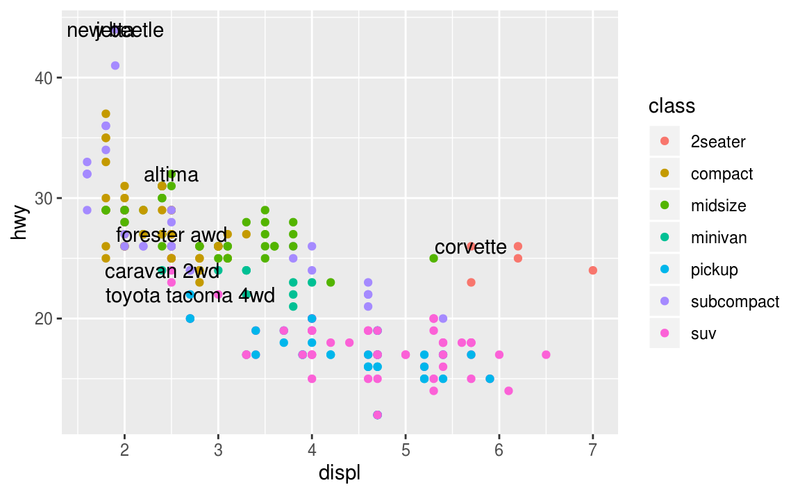 How can you use it to add a text label to a plot without having to create a tibble? What arguments to geom_label() control the appearance of the background box? What are the four arguments to arrow()? How do they work? Create a series of plots that demonstrate the most important options. Note the naming scheme for scales: scale_ followed by the name of the aesthetic, then _, then the name of the scale. The default scales are named according to the type of variable they align with: continuous, discrete, datetime, or date. There are lots of non-default scales which you’ll learn about below. You might want to tweak some of the parameters of the default scale. This allows you to do things like change the breaks on the axes, or the key labels on the legend. You might want to replace the scale altogether, and use a completely different algorithm. Often you can do better than the default because you know more about the data. You can use labels in the same way (a character vector the same length as breaks), but you can also set it to NULL to suppress the labels altogether. This is useful for maps, or for publishing plots where you can’t share the absolute numbers. You can also use breaks and labels to control the appearance of legends. Collectively axes and legends are called guides. Axes are used for x and y aesthetics; legends are used for everything else. Another use of breaks is when you have relatively few data points and want to highlight exactly where the observations occur. 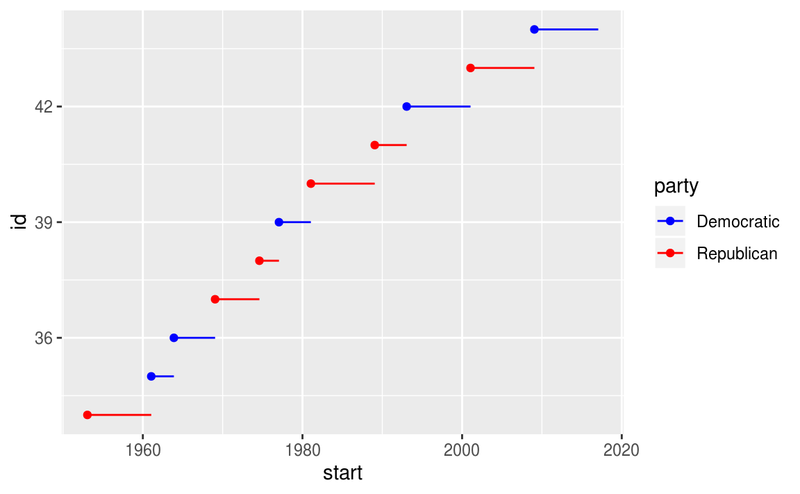 For example, take this plot that shows when each US president started and ended their term. date_labels takes a format specification, in the same form as parse_datetime(). date_breaks (not shown here), takes a string like “2 days” or “1 month”. You will most often use breaks and labels to tweak the axes. While they both also work for legends, there are a few other techniques you are more likely to use. You can also use legend.position = "none" to suppress the display of the legend altogether. To control the display of individual legends, use guides() along with guide_legend() or guide_colourbar(). The following example shows two important settings: controlling the number of rows the legend uses with nrow, and overriding one of the aesthetics to make the points bigger. 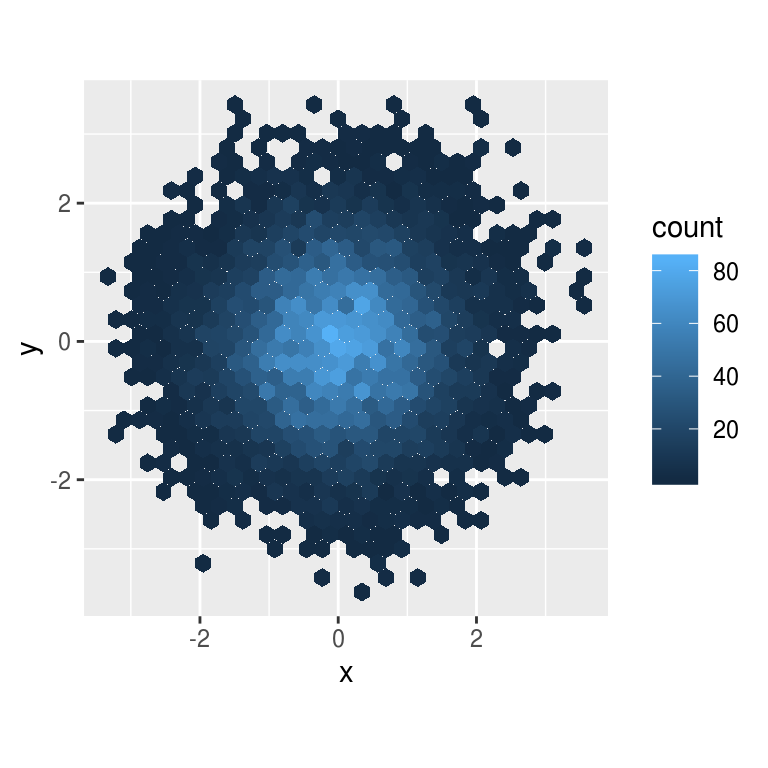 This is particularly useful if you have used a low alpha to display many points on a plot. Instead of just tweaking the details a little, you can instead replace the scale altogether. There are two types of scales you’re mostly likely to want to switch out: continuous position scales and colour scales. Fortunately, the same principles apply to all the other aesthetics, so once you’ve mastered position and colour, you’ll be able to quickly pick up other scale replacements. However, the disadvantage of this transformation is that the axes are now labelled with the transformed values, making it hard to interpret the plot. Instead of doing the transformation in the aesthetic mapping, we can instead do it with the scale. 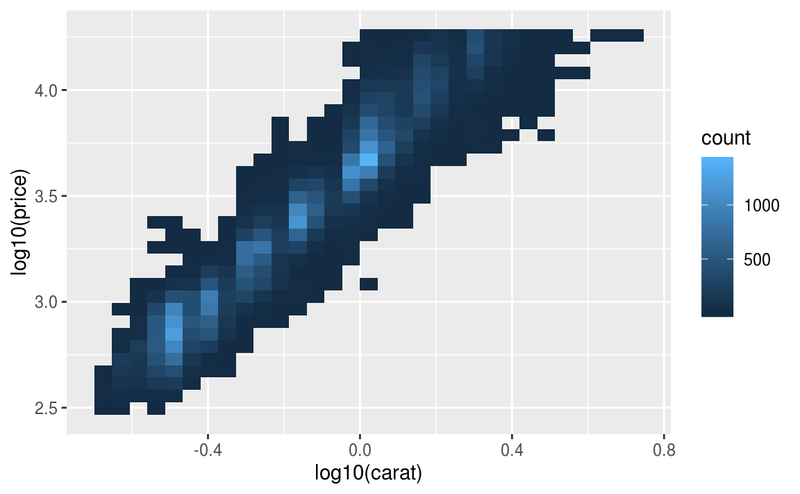 This is visually identical, except the axes are labelled on the original data scale. Another scale that is frequently customised is colour. The default categorical scale picks colours that are evenly spaced around the colour wheel. Useful alternatives are the ColorBrewer scales which have been hand tuned to work better for people with common types of colour blindness. 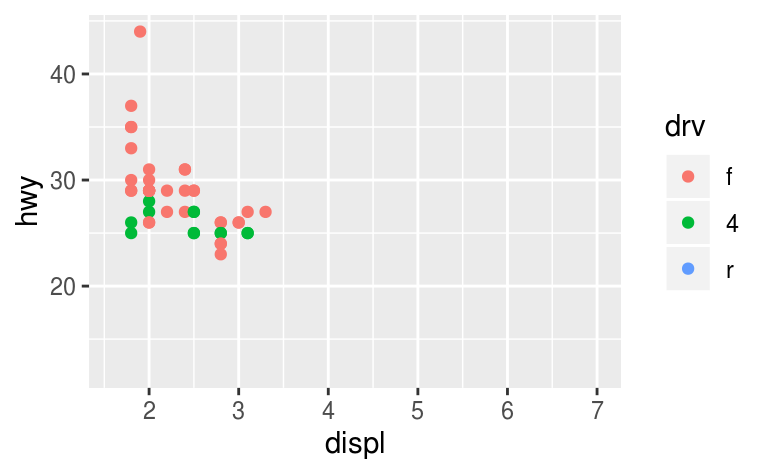 The two plots below look similar, but there is enough difference in the shades of red and green that the dots on the right can be distinguished even by people with red-green colour blindness. Don’t forget simpler techniques. If there are just a few colours, you can add a redundant shape mapping. This will also help ensure your plot is interpretable in black and white. The ColorBrewer scales are documented online at http://colorbrewer2.org/ and made available in R via the RColorBrewer package, by Erich Neuwirth. Figure 28.2 shows the complete list of all palettes. The sequential (top) and diverging (bottom) palettes are particularly useful if your categorical values are ordered, or have a “middle”. This often arises if you’ve used cut() to make a continuous variable into a categorical variable. Figure 28.2: All ColourBrewer scales. For continuous colour, you can use the built-in scale_colour_gradient() or scale_fill_gradient(). If you have a diverging scale, you can use scale_colour_gradient2(). That allows you to give, for example, positive and negative values different colours. 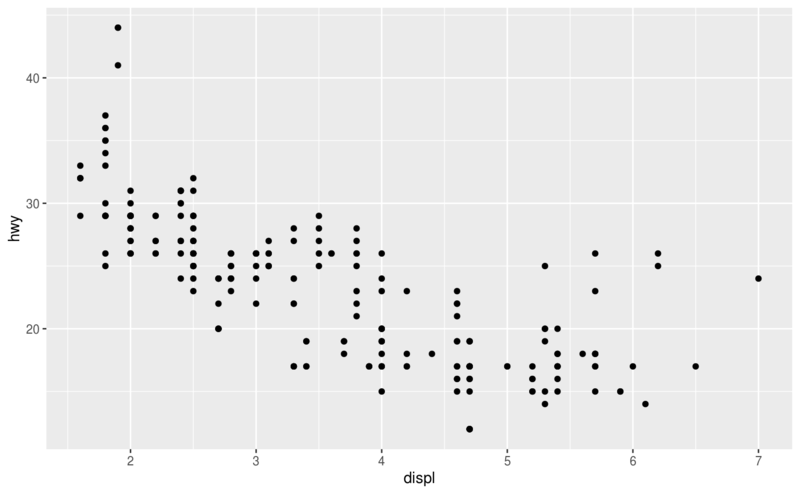 That’s sometimes also useful if you want to distinguish points above or below the mean. Another option is scale_colour_viridis() provided by the viridis package. It’s a continuous analog of the categorical ColorBrewer scales. The designers, Nathaniel Smith and Stéfan van der Walt, carefully tailored a continuous colour scheme that has good perceptual properties. 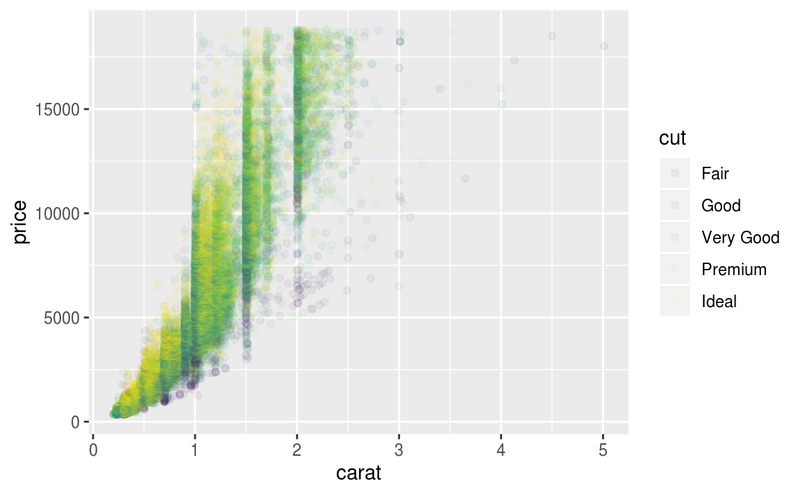 Here’s an example from the viridis vignette. Note that all colour scales come in two variety: scale_colour_x() and scale_fill_x() for the colour and fill aesthetics respectively (the colour scales are available in both UK and US spellings). Why doesn’t the following code override the default scale? What is the first argument to every scale? How does it compare to labs()? Combining the two variants shown above. Improving the display of the y axis. Labelling each term with the name of the president. Placing breaks every 4 years (this is trickier than it seems!). Use override.aes to make the legend on the following plot easier to see. You can also set the limits on individual scales. Reducing the limits is basically equivalent to subsetting the data. It is generally more useful if you want expand the limits, for example, to match scales across different plots. 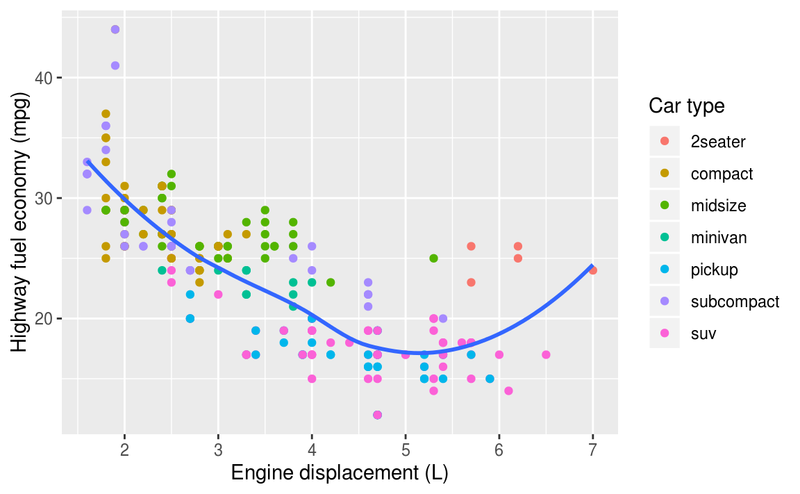 For example, if we extract two classes of cars and plot them separately, it’s difficult to compare the plots because all three scales (the x-axis, the y-axis, and the colour aesthetic) have different ranges. One way to overcome this problem is to share scales across multiple plots, training the scales with the limits of the full data. In this particular case, you could have simply used faceting, but this technique is useful more generally, if for instance, you want spread plots over multiple pages of a report. 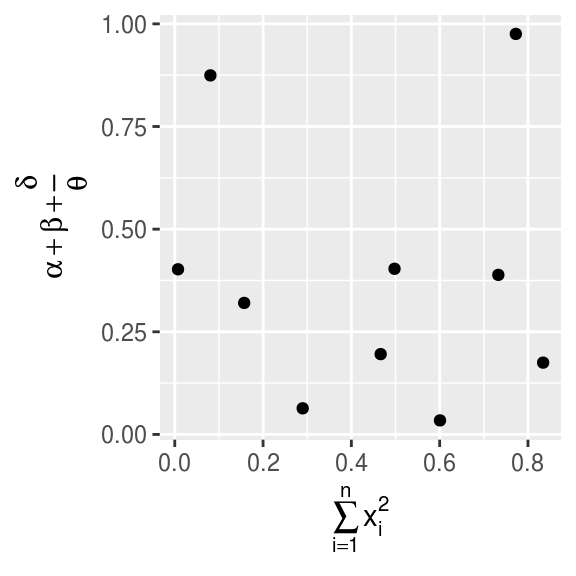 ggplot2 includes eight themes by default, as shown in Figure 28.3. Many more are included in add-on packages like ggthemes (https://github.com/jrnold/ggthemes), by Jeffrey Arnold. 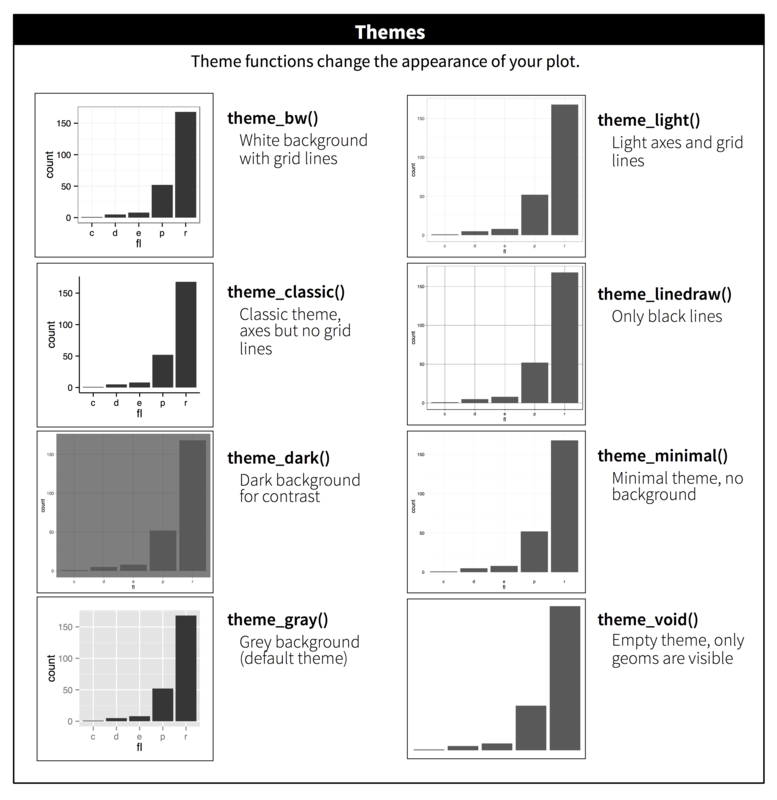 Figure 28.3: The eight themes built-in to ggplot2. Many people wonder why the default theme has a grey background. This was a deliberate choice because it puts the data forward while still making the grid lines visible. The white grid lines are visible (which is important because they significantly aid position judgements), but they have little visual impact and we can easily tune them out. The grey background gives the plot a similar typographic colour to the text, ensuring that the graphics fit in with the flow of a document without jumping out with a bright white background. Finally, the grey background creates a continuous field of colour which ensures that the plot is perceived as a single visual entity. It’s also possible to control individual components of each theme, like the size and colour of the font used for the y axis. Unfortunately, this level of detail is outside the scope of this book, so you’ll need to read the ggplot2 book for the full details. You can also create your own themes, if you are trying to match a particular corporate or journal style. If you don’t specify the width and height they will be taken from the dimensions of the current plotting device. For reproducible code, you’ll want to specify them. 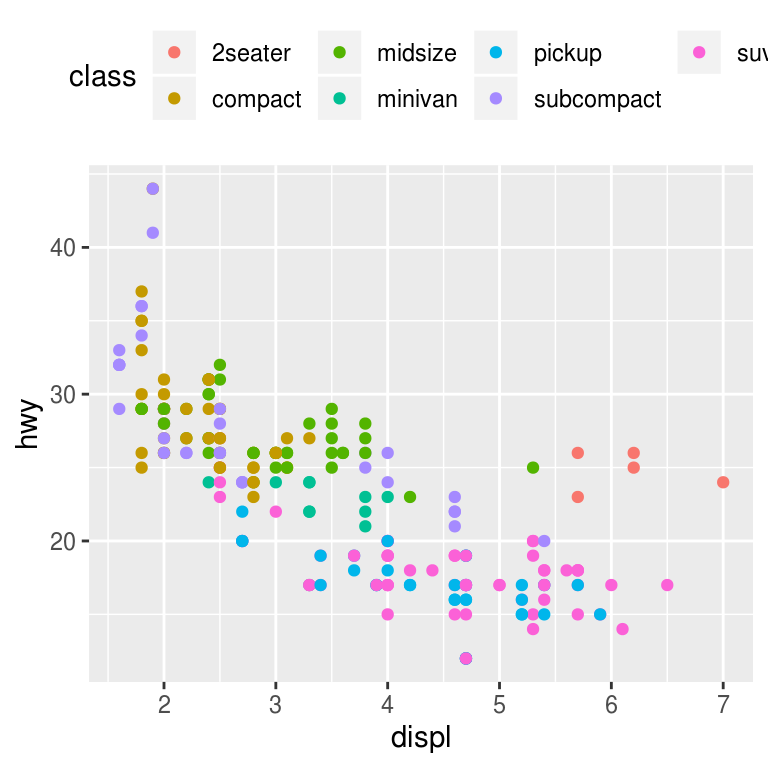 Generally, however, I think you should be assembling your final reports using R Markdown, so I want to focus on the important code chunk options that you should know about for graphics. You can learn more about ggsave() in the documentation. 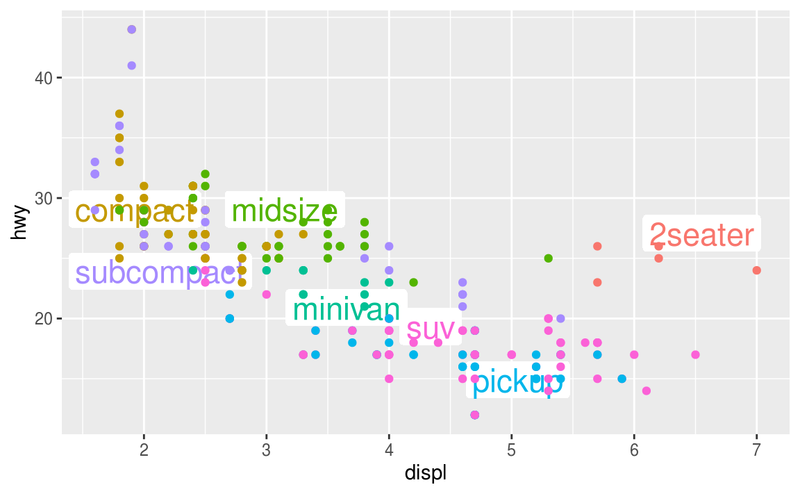 The biggest challenge of graphics in R Markdown is getting your figures the right size and shape. There are five main options that control figure sizing: fig.width, fig.height, fig.asp, out.width and out.height. Image sizing is challenging because there are two sizes (the size of the figure created by R and the size at which it is inserted in the output document), and multiple ways of specifying the size (i.e., height, width, and aspect ratio: pick two of three). 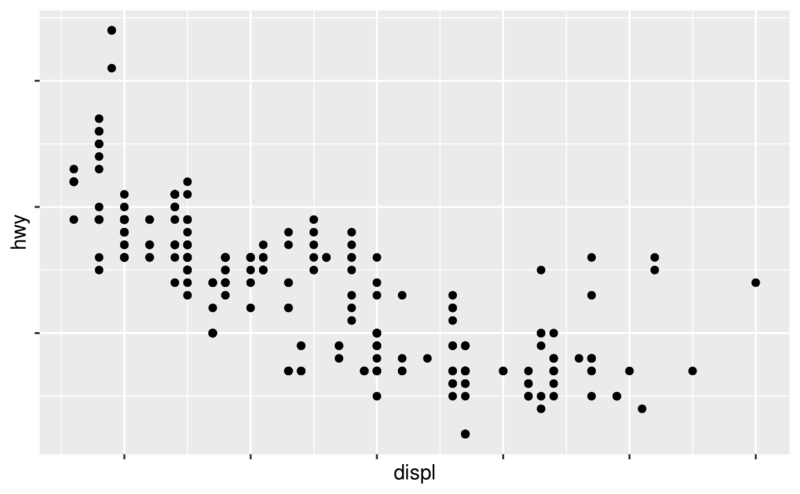 I find it most aesthetically pleasing for plots to have a consistent width. To enforce this, I set fig.width = 6 (6") and fig.asp = 0.618 (the golden ratio) in the defaults. Then in individual chunks, I only adjust fig.asp. I control the output size with out.width and set it to a percentage of the line width. I default to out.width = "70%" and fig.align = "center". That give plots room to breathe, without taking up too much space. 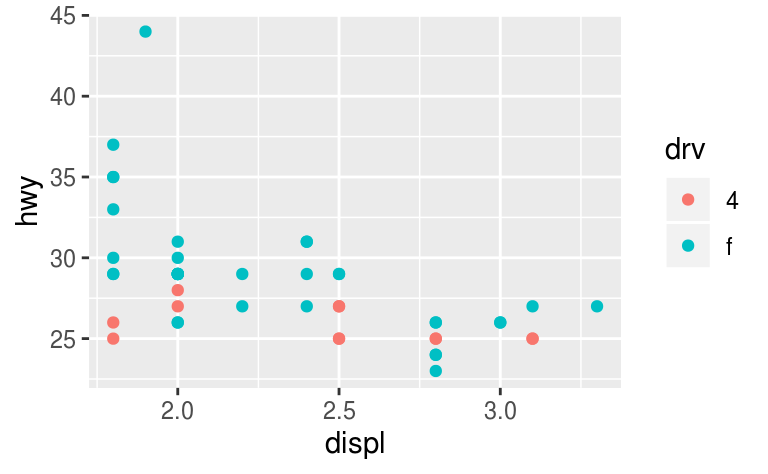 To put multiple plots in a single row I set the out.width to 50% for two plots, 33% for 3 plots, or 25% to 4 plots, and set fig.align = "default". Depending on what I’m trying to illustrate ( e.g. 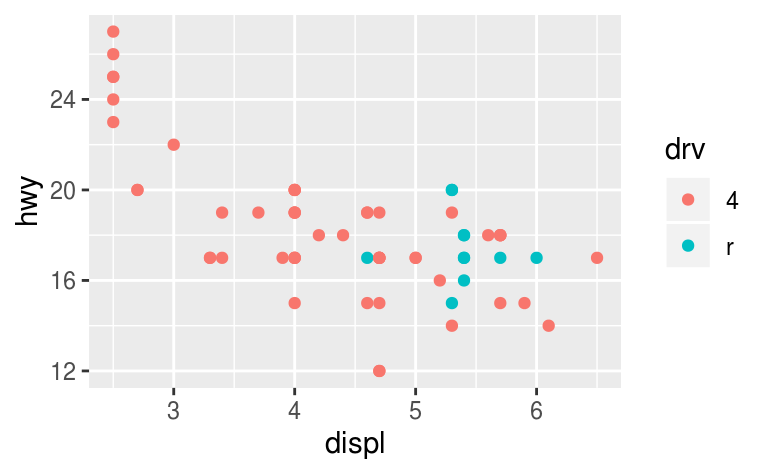 show data or show plot variations), I’ll also tweak fig.width, as discussed below. If you want to make sure the font size is consistent across all your figures, whenever you set out.width, you’ll also need to adjust fig.width to maintain the same ratio with your default out.width. For example, if your default fig.width is 6 and out.width is 0.7, when you set out.width = "50%" you’ll need to set fig.width to 4.3 (6 * 0.5 / 0.7). When mingling code and text, like I do in this book, I recommend setting fig.show = "hold" so that plots are shown after the code. This has the pleasant side effect of forcing you to break up large blocks of code with their explanations. To add a caption to the plot, use fig.cap. In R Markdown this will change the figure from inline to “floating”. If you’re producing PDF output, the default graphics type is PDF. This is a good default because PDFs are high quality vector graphics. 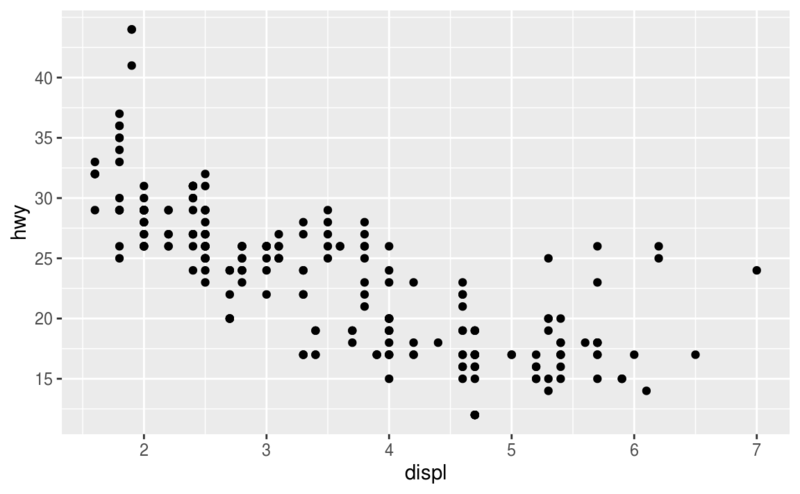 However, they can produce very large and slow plots if you are displaying thousands of points. In that case, set dev = "png" to force the use of PNGs. They are slightly lower quality, but will be much more compact. It’s a good idea to name code chunks that produce figures, even if you don’t routinely label other chunks. The chunk label is used to generate the file name of the graphic on disk, so naming your chunks makes it much easier to pick out plots and reuse in other circumstances (i.e. if you want to quickly drop a single plot into an email or a tweet). 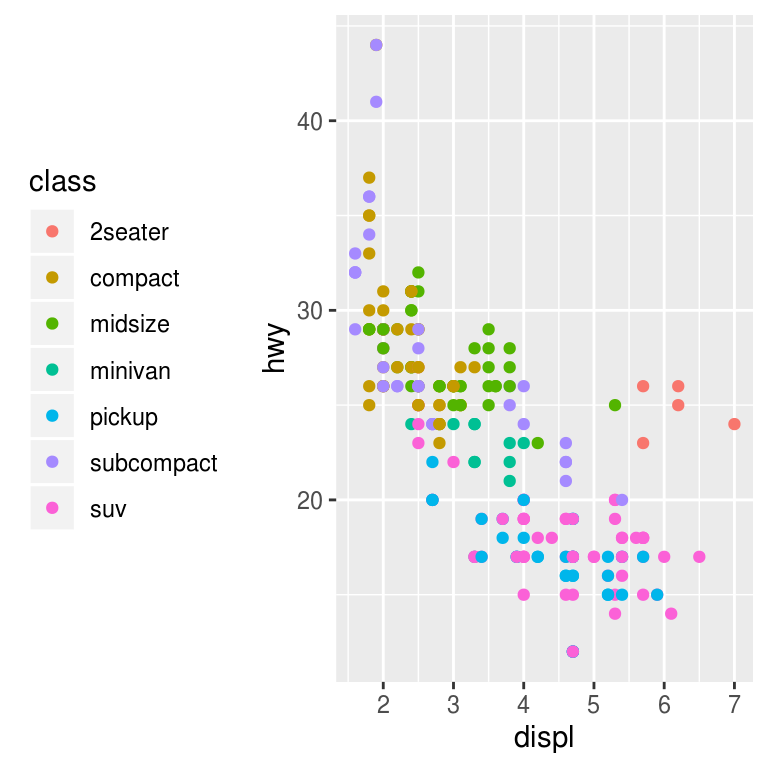 The absolute best place to learn more is the ggplot2 book: ggplot2: Elegant graphics for data analysis. It goes into much more depth about the underlying theory, and has many more examples of how to combine the individual pieces to solve practical problems. Unfortunately, the book is not available online for free, although you can find the source code at https://github.com/hadley/ggplot2-book. 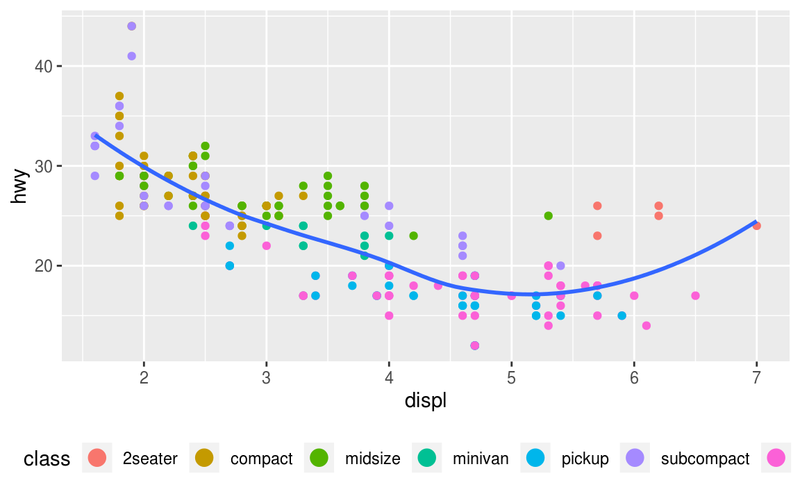 Another great resource is the ggplot2 extensions guide http://www.ggplot2-exts.org/. 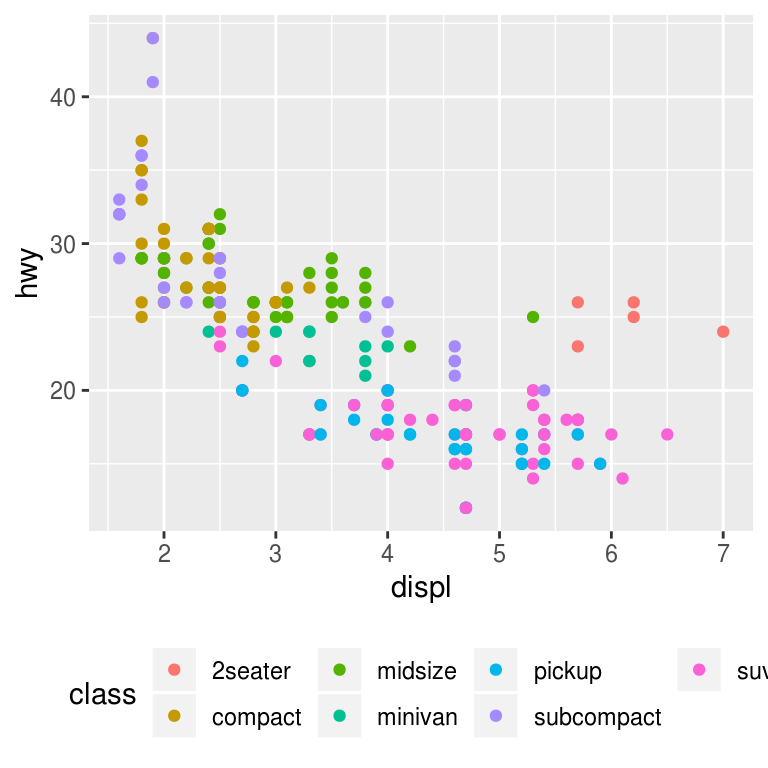 This site lists many of the packages that extend ggplot2 with new geoms and scales. It’s a great place to start if you’re trying to do something that seems hard with ggplot2.